The last time I was in a Raptor it was warm, muggy and a bit wet. It was then that I realized how awesome this next generation off-road truck had become. So now for some contrast, we find ourselves in the snow and cold of winter with the updated bird of prey. This time it’s a big SuperCrew model loaded to the gills with all of the good stuff for an as-tested price of $72,000. It’s the F-150 you want if you prefer your seat time out here instead of on the pavement. Fast, ferocious and a ton of fun to drive, the Raptor is tricked out with FOX shocks, high performance springs, K02 tires, skid plates, beefed up differentials and a Trail Control system that adapts the truck to whatever terrain you’d like, including a Sport mode that put’s this twin-turbo V6 front and center. It’s the epitome of imposing wherever it’s seen – so wide and unique in its style, the Raptor name has big time cache. I didn’t sense the need for any major changes but Ford came up with at least one paired with a couple of more nominal updates. The last thing I figured the Raptor needed was a suspension upgrade but that’s indeed what Ford did with these electronically controlled shocks now with continuous damping technology which is supposed to improve both on and off road but it doesn’t. The Raptor as a daily driver has definitely taken a hit. This has been a surprise to me but you feel a lot more of the paved road in this Raptor than with the previous shocks. Co-developed with Ford, FOX’s Live Valve Technology constantly reads a variety of vehicle sensors and then adjusts the compression of the shocks in real time with the goal of maximizing handling, comfort and bottom out resistance. You can literally feel them at work doing something as simple as backing out of your driveway. And when you’re getting after it off-road the Raptor continues to amaze with its magic carpet like ride. It’s so smooth when the going gets rough. But based upon my memories and notes from my previous test-drive, this one doesn’t skew as favorably to on-road work where the Raptor now feels decidedly truckier. Next, there’s the new Trail Control system. Much like Land Rover’s setup but easier to activate with this button here, the Raptor’s acts as a low-speed cruise control from anywhere between 1-20mph. For rugged terrain, this allows the driver to focus solely on steering while the truck automatically adjusts power and braking to each individual wheel for super smooth operation. And thirdly, there are all-new Recaro seats to better compliment the Raptor’s capabilities, affording more support to those held in by their generous levels of bolstering. And with these blue Alcantara inserts, they look spectacular and elevate the interior’s style. The previous Raptor I tested was of the Super Cab variety but this one here is the full-sized 4-door Super Crew and as you can see there’s no lack of legroom. Flip-up split bench seats and a fully flat load floor maximize the Super Crew’s versatility. It’s enormous and even includes heated seats and charging options. With the benefit of the grandiose $9,400 802A package, Interior Color Accent Package and Raptor Technology Group, this truck has nearly everything a Raptor offers minus a sunroof. It’s loaded with unbelievably detailed gauges, rudimentary but easy to use infotainment and all of the safety and creature comforts of a luxury automobile. It’s a great cabin…not the high-end feel of a Ram 1500 Limited but more of a sport-lux feel. I really like its personality. And despite its sizable width, the 360 degree camera makes the Raptor far more everyday manageable than you’d imagine. Add power retractable mirrors and trips to the grocery store are very much in play without much parking drama. Driving a Raptor off-road is an experience you won’t soon forget. While other trucks can get the job done out here the Raptor absolutely craves this stuff. The shocks are amazing at leveling out whatever you’re running over. The feeling of invincibility is off the charts. And that’s aided by the plethora of drive modes, cameras and gauge displays. Really remarkable stuff. But this truck is wide which makes everyday use a little less fun and I don’t recall feeling this much of the road in my first test drive. It seems less polished to me. 450 horsepower and 510 pound-feet of torque from the 3.5-liter twin-turbo V6 make acceleration effortless but standing starts aren’t as mindblowing as you might think despite a 0-to-60mph time in the mid 4s. It does sound pretty good, though. The 10-speed auto and an engine start-stop system do their part to save some gas but if you get about 15mpg consider yourself lucky. And Ford recommends premium unleaded. 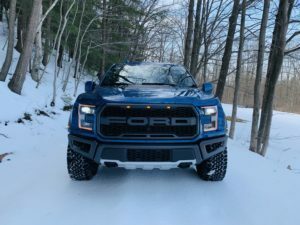 The Raptor continues to nest at the top of the off-road truck segment but I’m not sure the 2019 model is necessarily more desirable than before.